The Enterprise import plug-in allows you to archive publications, Issues and Dossiers, including all related images and articles and produced PDF's from Enterprise into Elvis. The Enterprise import plug-in is configured inside the plug-in configuration file, all configuration properties are described in detail in this file. Copy - default method for Elvis 1.0 - 3.x: All files are copied when importing from Enterprise. This ensures that the folder where the files are imported will always contains all the original files from Enterprise. As a side effect, it may result in duplicate files in Elvis. Reference - default method for Elvis 4.0 and up: Files which are not yet in Elvis will be copied on importing. Files which are already in Elvis will not be imported, only the relations for these fiels are created. The behavior can be changed using the createRelationsWhenPossible setting in the import plug-in. Note: This new integration is compatible with Enterprise 8.2 and up. For correct operation, some statuses have to be setup in Enterprise. 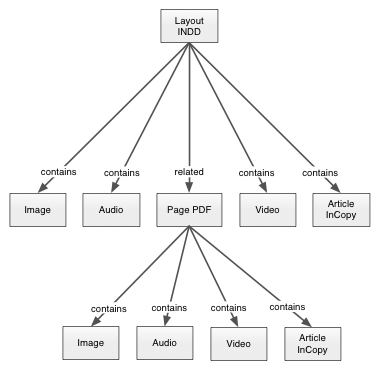 The image below you shows the workflow states as they should be configured in Enterprise. You can use different state names if they already exist, but in that case you have to modify the plug-in configuration file accordingly. Objects with this states will be downloaded and archived. Must have produce flag turned on for layouts so PDFs are available. Next status must be set to Archived. This could be another status as well, as long as it is not the SendToArchive state itself! Once imported the next status ensures the object is marked as archived. When an object cannot be archived for any reason it will be set to this state so the import module can continue with other object that are in the "SendToArchive" state. More information about the failure can be found in the plug-in log files. For objects that should be excluded from being archived automatically when they have been placed on a layout or part of a dossier being archived. Info: This features is available since Elvis 4.4.1. After a layout is archived in Elvis, it should be treated as readonly in Elvis, we want to preserve the state of the layout and the images as it was at the point it's archived. When the ww-import plug-in is used in combination with the Elvis Content Source, this could lead to issues as layout and image updates in Enterprise are always synced to Elvis by default. Relation metadata is being updated in Elvis when, for example, images are added to- or removed from a layout or a layout or deleted in Enterprise. To prevent this from happening, a new config setting is introduced in the Elvis Content Source: ELVIS_ARCHIVED_STATUSES. This setting should match the statuses from the Elvis import plug-in property archivedStatuses. Layouts with this state will not update the relation on any of its shadow objects. A new metadata property Archived is introduced. The Enterprise import plug-in sets this property to true for all newly archived assets but also for shadow images related to an archived layout. The default for this property is false. This property can be used to trigger, for example, moving images to a special "Archive Zone" or base permission rules on. Relations are only stored for shadow images. See the Elvis and Enterprise compatibility matrix for an overview of which Enterprise and Elvis version this is supported. When a layout is imported, any objects (Articles, Images) placed on it in Enterprise will be presumed final as well and will also be imported automatically. Their states will not be changed so no extra configuration is required. 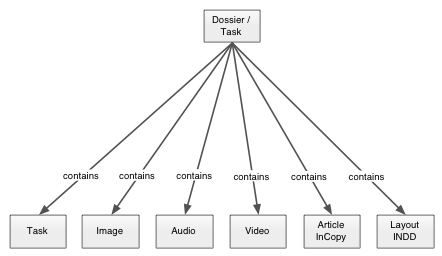 When a Dossier is imported, any objects (Layouts, articles, images, videos, Tasks and audio files) contained by the Dossier will be presumed final as well and will also be imported automatically. Their states will not be changed so no extra configuration is required. The plug-in configuration file allows you to specify what material should be archived. Note: When an object being imported into Elvis already exists in Elvis this is detected and will cause the item to be updated instead of creating a new one.